I happened to visit Facebook’s Business Solutions page, and was struck by how, at least on the surface, these advertising formats seem like exactly the kind of innovation that should be helping Facebook achieve Goolge-style revenue — which is of course what Facebook’s $15 billion valuation assumes will happen. Can you imagine a traditional media company with 100 MILLION viewers/readers/subscribers and only $300 million in revenue? Why isn’t Facebook making more money? Thinking about that question, I went over to Google’s Advertising Solutions page to compare the way AdWords is described to the way Facebook’s offerings are described. Promote your website or Facebook Page with highly-targeted advertising. 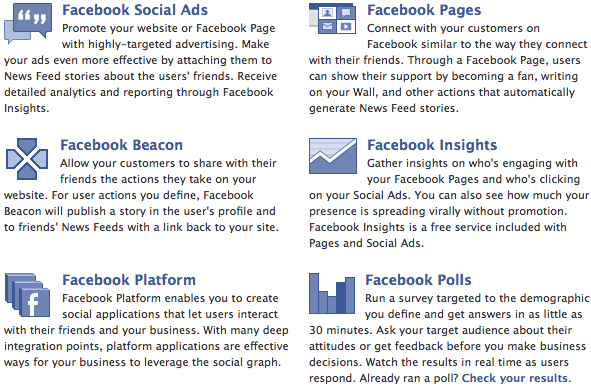 Make your ads even more effective by attaching them to News Feed stories about the users’ friends. Allow your customers to share with their friends the actions they take on your website. Connect with your customers on Facebook similar to the way they connect with their friends. With Google you can reach people who are looking for precisely what you have to offer. With Facebook you can insert your ad into news about peoples’ friends. You can let people share their shopping habits with their friends. And you can, as a company/brand, be “friends” with your consumers. What’s the key difference between Google’s value proposition and Facebook’s? With Google, the value to users and the value to advertisers is perfectly aligned. Everybody wins. With Facebook, if you read between the lines, it’s really the same value proposition as traditional advertising — advertisers forcing themselves on users, in a way that creates little or no value for the users. How many Facebook users have a burning need to find ads in their friends’ newsfeeds? Or share their shopping habits? Or make friends with brands? 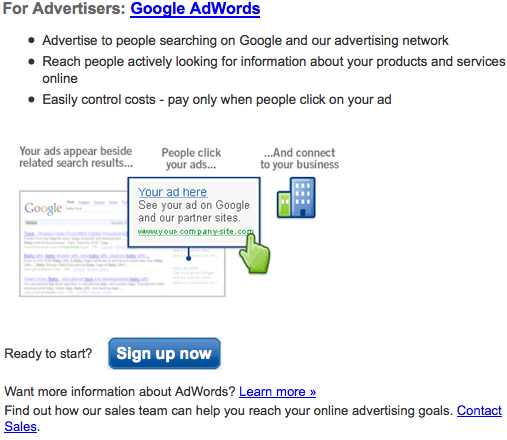 Is it possible on the web to have a more perfect alignment between advertiser and user value than search advertising? I don’t know, but it seems a pretty safe bet that Facebook’s ad formats aren’t it. If you’re in media in the web era, you’d better be working on a business model that creates huge value for users. Either that, or be content to have a small business by traditional media standards.